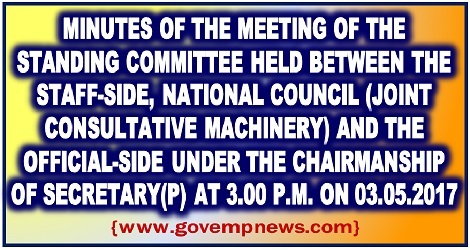 Minutes of the Meeting of the Standing Committee held between staff side NC (JCM) and Official side at 3.00 p.m. on 03.05.2017; The meeting of the Standing Committee of the National Council (JCM) was held at 3.00 p.m. on 03.05.2017 under the Chairmanship of Secretary (P) at Room No. 119, North Block, New Delhi. The list of participants is at Annexure. The meeting of the Standing Committee of the National Council (JCM) was held at 3.00 p.m. on 03.05.2017 under the Chairmanship of Secretary (P) at Room No. 119, North Block, New Delhi. The list of participants is at Annexure. 2. In his introductory comments, Secretary(Personnel) while welcoming the participants, mentioned that the agenda for the meeting included the action taken statement on the 31 items discussed in the last meeting held on 25.10.2016 and 26 additional items received from the Staff Side. 3. (i) In his opening remarks, Secretary, Staff-Side thanked the Chairman for convening the meeting and urged that as per the JCM Scheme, the meetings of the National Council should be held on quarterly basis. He also pointed out that the meeting of the National Council under the Chairmanship of Cabinet Secretary has not been held since 2010 which, he emphasized, was against the spirit and the basic principle of the JCM Scheme. This view was seconded by other representatives of the Staff-Side. (ii) Secretary (Staff-Side) further requested to know the present position on the basic demands made by the Central Government employees about minimum wages, fitment formula, reversion to the old pension scheme and the report of the Committee of Allowances. He recalled that when a notice for strike was given in 2016, the senior Cabinet Ministers in the Central Government had met the staff side representatives and assured a positive decision on the aforesaid demands. Although that strike was deferred on this assurance, the central govt. employees are still waiting. Consequently, it is getting difficult to make the central government employees understand the reasons for delay in fulfilment of the assurances then given by the Senior Cabinet Ministers. (iii) Hence Secretary, Staff-Side requested the Chairman to convey to the Cabinet Secretary and Chairman, National Council (1CM) the duty to meet the Government employees in accordance with the JCM Scheme to avoid an atmosphere of confrontation. (iv) He stated that a number of agenda items proposed by the Staff-Side have been deleted and no formal communication has been sent to them on the reasons for deletion. He requested that the views of official side on this may be communicated to them. This sentiment was echoed by other members of the Staff-Side. He also mentioned that the senior Cabinet Ministers had issued a statement about constitution of a High Level Committee to look into the aforesaid basic demands made by the Staff Side while giving the strike notice. However, even after more than 10 months, nothing has happened and only one meeting was taken by Additional Secretary in Department of Expenditure. (v) On allowances, he informed that there is a lot of uncertainty on whether the allowances would become admissible prospectively or from 01.01.2016 i.e., the date of implementation of 7th Central Pay Commission. a. The assurance given by Senior Ministers on 30th June 2016 on 7th CPC issues-mainly minimum wage and multiplying factor have not been fulfilled. Only one meeting was held by Addl. Secretary (Expenditure) with the Staff side and thereafter nothing is known with regard to progress made even though 10 months passed. c. On Allowances, the Leader JCM (Staff Side) expressed disappointment as there has been no positive outcome even after lapse of several months. He requested the Chairman that the JCM (Staff Side) demand to revise the Allowances w.e.f. 01/01/2016 should be considered and Staff Side demand be taken to the level of Cabinet Secretary and the Government. d. Although Ministry of finance Resolution dated 25th July 2016 stipulates that 14.29% hike in the pay of Running Staff in the Railways be ensured, unfortunately, the same has not been complied with. The said hike has not been ensured. He requested the Chairman to kindly take appropriate initiative on the proposal sent by Ministry of Railways which is pending with the Ministry of finance. He also pointed out that the references made by different ministries to the DoP&T/MoF pursuant to the discussions held by the JCM Constituents with the respective Departments/Ministries are pending. He requested that speedy response be ensured by DoP&T/MoF. While concluding, the Leader, JCM (Staff-Side) expressed confidence that the NC/JCM meeting as well Standing Committee meetings will be convened regularly in accordance with the JCM rules for paving way for healthy industrial relations”. (viii) The Staff-Side also pointed out that items of agenda sent by them are to be included, if it is found to be appropriate to be discussed. Since there had been permanent subcommittees under the Chairmanship of Secretary. (Health) and (Pension), the agenda items pertaining to those two ministries can be referred to those two sub-committees. The sub-committees are to deliberate and report back to the Standing Committee for a final decision. They wanted the said procedure to be followed as the items sent by the Staff Side to the meeting contained many Pension and Health related issues. 4. Chairman, in his reply, said that no agenda points had been deleted and, in order to ensure that discussions are complete in a meeting, it was decided in consultation with the Secretary(Staff-Side) to limit the number of agenda points for today’s meeting. He further stated that if the Staff-Side insists that the remaining points which have been left out should also be taken up for discussion, they would need to be circulated to the concerned Departments in advance for their He emphasized that the Government attaches the highest priority to the Staff-Side and the concerns expressed over the assurance given after the strike call would be conveyed to the concerned authority. On the issue of the Allowances Committee’s report not being shared with the Staff Side, the Chairman stated that the sentiment would also be conveyed to Ministry of Finance along with the concerns over pay revision etc. 5. After these opening remarks the Action-Taken-Note on the minutes of the last meeting held on 25.10.2016 was taken up for discussion. S.No.1 — Item no, 5(i) of the Standing Committee meeting of 25.10.2016. S.No. 3 — Settle all anomalies of the Sixth Central Pay Commission. S.No. 4 — No privatisation, PPP or FDI in Railways and Defence Establishments. S. No. 5 — No corporatization on Postal Services. S.No. 6 — No ban on recruitment/creation of posts. S. No. 7 — Scrap PFRDA Act and reintroduce the defined benefit statutory pension scheme. S.No. 8 – Ns, outsourcing, contractorisation, privatisation of governmental function; withdraw the proposed move to close down the printing press, publication, form store and stationery departments and medical stores depots. S.No. 9 – Regularise the existing daily rated/casual and contract workers, and absorb trained apprentices. No labour reforms should be carried out which are not in the interest of workers. S.No. 10 – Revive JCM functioning at all levels as an effective negotiating forum for settlement of demands of the central government employees. S.No. 11- Remove the arbitrary ceiling on compassionate appointments. S. No. 12 — Ensuring five promotions in the service career. S.No. 13 – Non-implementation of the decision taken in the 46th National Council (JCM) Meeting held on 15th May 2010 with regard to Item No. 20. S.No. 14 – Reduction of one day Productivity Linked Bonus (PLB) to the employees of OFB & DGQA under Department of Defence Production against Cabinet decision and Government orders. S.No. 15 –Grant of one time relaxation to the Central Government employees who have availed LTC-80 and traveled by air by purchasing ticket from authorities other than authorised agents. S.No. 16 — Grant of House Rent Allowance to the employees who have vacated government quarters. S.No. 17 — Restoration of interest-free advances withdrawn by the Government based on 7th CPC recommendations. S.No. 18 — Grant of entry pay recommended by 6th CPC to the promotees under the provisions of CCS(RP) Rules- 2008. S.No. 19 – Grant of 3rd MACP in GP Rs.4600 to the Master Craftsmen (MCM) of Defence Ministry who were holding the post of MCM in the pre-revised pay scale of Rs.4500-7000 as on 31/12/2005. S.No. 20 – Carrying forward of Earned Leave by Defence Industrial Employees on transfer / appointment from non Industrial to Industrial Establishment. S.No. 21 – Reimbursement of actual medical expenditure incurred by the employees in recognized hospitals. S.No. 22 – Dental Treatment in private hospitals recognized under CGHS / CS(MA) Rules, 1944 for CS(MA) beneficiaries. S.No. 23 – Review of the income criteria for the dependent parents of government employees in the wake of the recent legislation of “Maintenance and Welfare of Parents and Senior Citizens Act 2007”. S.No. 25 – Withdraw the stringent conditions unilaterally imposed by Government on grant of Modified Assured Career Progression (MACP) in promotion and grant of MACP on promotional hierarchy. S. No. 26 – Removal of ambiguity in fixation of pay of re-employed ex-servicemen and grant of the same benefit extended to commissioned officers to personnel below officers rank also. S.No. 27 – Permission to opt for pay fixation in the revised pay structure on a date after the date of issue of CCS(RP) rules 2016 notification (25.7.2016) in case of employees whose promotion becomes due after 25.7.2016. S.No. 28 – Extension of the benefit of bonus calculation ceiling enhancement of Rs. 7000/- to Gramin Dak Sevaks (GDS) of the postal department also. S.No. 29 – Regularise the services of casual labourers by absorbing them against vacant posts of MTS as one time measure. S.No. 30 – Fill up all vacant posts including promotional posts in a time bound manner.